After 18 years of marriage, I believe there is one “key” unlike any other. Disclaimer: Affiliate links are personal to us. If you would like to find out more of what we will and won’t promote, please view on our blog. Friends, I can tell you without a doubt that prayer has made the biggest difference in our marriage. In all aspects of our life together. But like many other wives, I went years before I realized the power of prayer in marriage. 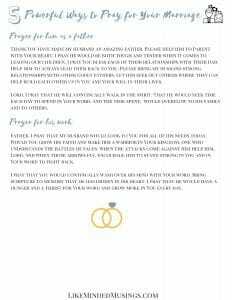 We were part of a small group community that encouraged us to pray for and with our spouses. Which is exactly when I realized I had no idea how to pray for our marriage. 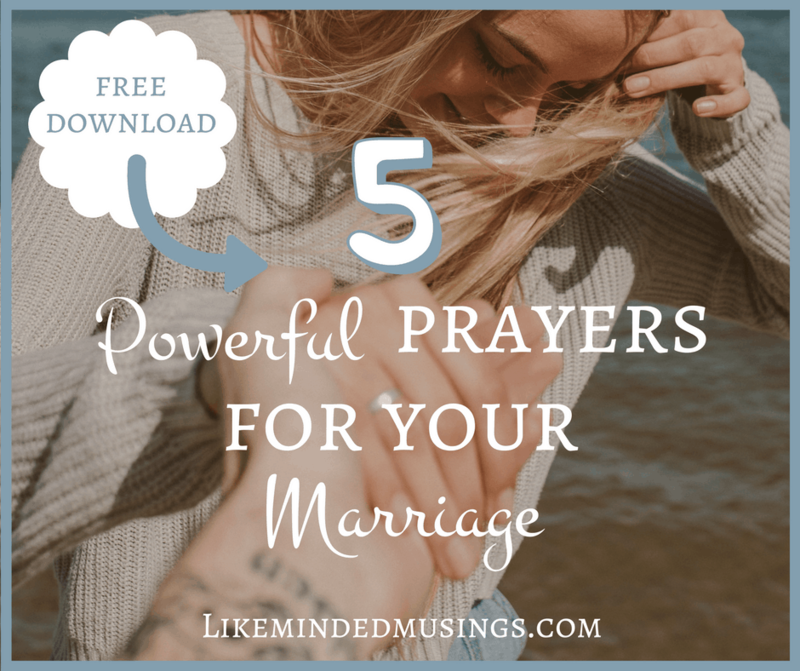 Find Out 5 Powerful Ways to Pray For Your Marriage Today! But I discovered something that day. I wanted to know more about prayer for the first time in my life. I wanted to experience what others in our group had. I wanted a deeper connection with Jesus and my husband. After reading an amazing little booklet on some how to’s in prayer, followed by Stormie Omartian’s The Power of a Praying Wife my eyes were opened wide and I never looked back. Don’t get me wrong, it has been a process! I will continue to learn and grow in the area of prayer for my husband and marriage – but one thing I know for certain is I will never stop! I have seen firsthand God’s goodness and grace in answering prayer in my marriage. I have seen that He doesn’t “need me” to work in my husband’s heart. I have seen answers to prayer in amazingly short amounts of time as well as answers to prayer after years. Either way, God has been faithful. Maybe today you find yourself at a point where you don’t know how to pray for your husband. Or you pray for your husband already but want to pray more specifically. 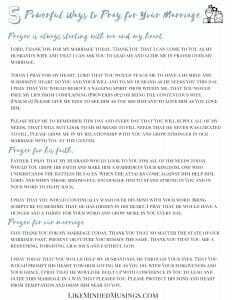 I’d like to walk you through five prayers that I pray for my husband regularly. These are the areas that I have learned to cover in prayer most often. Don’t worry if it doesn’t all apply to you, I believe God will direct you as you pray. This is just to help get you started. It can be used as a starting point for you to adjust to your current circumstances. Prayer is always starting with me and my heart. Lord, thank You for my marriage today. Thank You that I can come to You as my husband’s wife and that I can ask You to lead me and guide me in prayer over my marriage. Today I pray for my heart. Lord that You would teach me to have a humble and submissive heart to You and Your will and to my husband as he seeks You this day. I pray that You would remove a nagging spirit from within me, that You would free my lips from complaining (Proverbs 18:7) or being the contentious wife. (Psalm 15) Please give me eyes to see him as You see him and to love him as You love him. Please help me to remember this day and every day that You will supply all of my needs, that I will not look to my husband to fill needs that he never was created to fill. Please grow me in my relationship with You and grow stronger in our marriage with You at the center. Father, I pray that my husband would look to You for all of his needs today. Would You grow his faith and make him a warrior in Your kingdom, one who understands the battles he faces. When the attacks come against him help him, Lord. And when those arrows fly, encourage him to stand strong in You and in Your word to fight back. I pray that you would continually wash over his mind with Your word. Bring scripture to memory that he has hidden in his heart. I pray that he would have a hunger and a thirst for Your word and grow more in You every day. Make sure to Pin This for later and share with a Wife who needs it! God thank You for my marriage today. Thank You that no matter the state of our marriage past, present or future You remain the same. Thank you that You are a redeeming, forgiving, gracious and faithful God. I pray today that You would help my husband see me through Your eyes. That You would prompt his heart towards loving me as You do, with Your forgiveness and Your grace. I pray that he would be built up with confidence in You to lead and guide this marriage in a way that pleases You. Please protect his mind and heart from temptation and draw him near to You. Thank You have made my husband an amazing father. Please help him to Parent with Your heart. I pray he would be both tough and tender when it comes to leading our children. I pray You bless each of their relationships with their Dad. Help him to always lead them back to You. Please bring my husband strong relationships with other Godly fathers. Let him seek out others where they can help build each other up in You and Your will in their lives. Lord, I pray that he will continually walk in the spirit. That he would seek time each day to spend in Your word. And the time spent, would overflow to his family and to others. God thank You that my husband is a hard worker. I pray You continue to bless the work of his hands each day. Direct him and guide him in his work and in the relationship with his co-workers. I pray for continued physical strength and protection over him as he works today. Thank You for the gifts that You have given him. I pray that he would seek out opportunities to use those gifts to glorify You! So that my friend has been the #1 key to a fulfilling Marriage for me these last years. 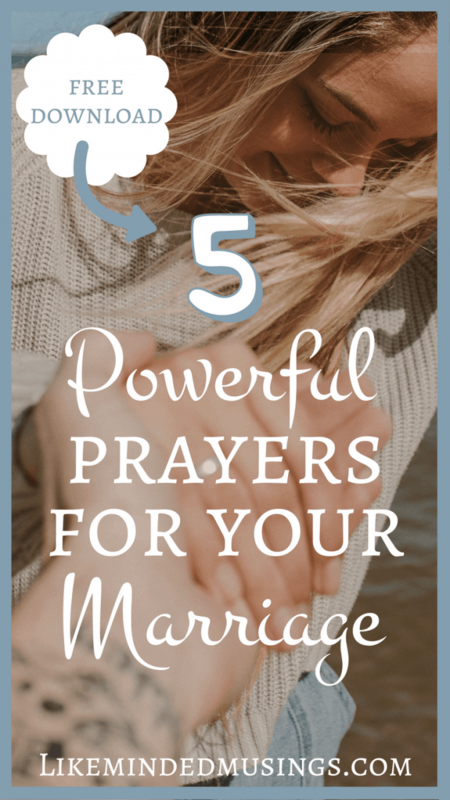 These 5 Powerful Ways to Pray for a Your Marriage have made a continual difference, not because they are “special prayers” but because we serve an awesome God who loves us, our marriages and when we come to Him as the source of all of our needs. I pray they would bless and encourage you as well! 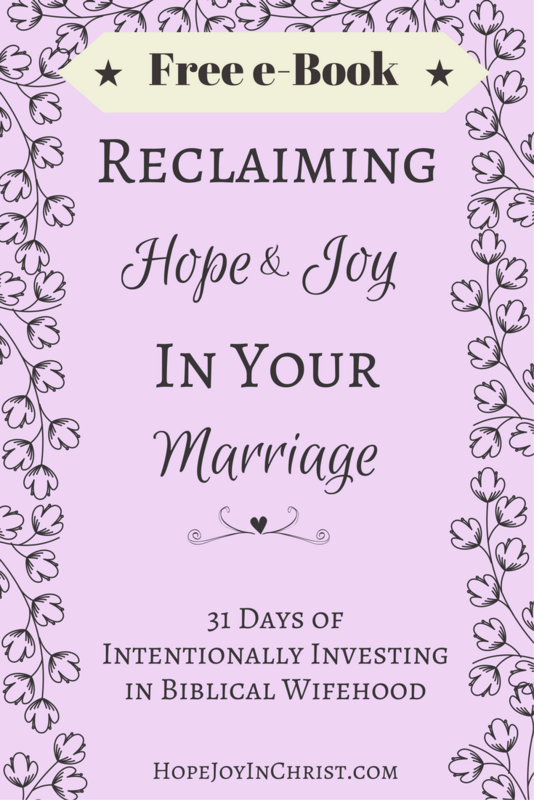 If you are in need of more Biblical Marriage encouragement, make sure to download your FREE ebook to Reclaim Hope & Joy in Your Marriage Today! PS If you want to be intentional in Marriage when life is a mess, read this! It’s funny how often we forget to pray for our marriage in the midst of all the other things we pray for. Great list friend!